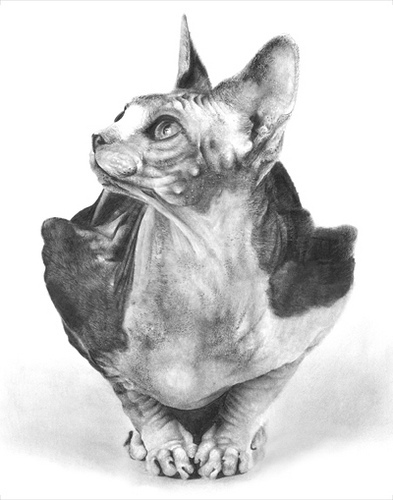 We are a small Cattery exclusively breeding and showing Sphynx. We are located in a quite town outside of Fort Worth, Texas. I have been involved with showing and breeding various purebred cats, dogs, and small live stock for 24 years. The kittens are exposed to various normal household noises and our toddler who loves to play with all the animals! Kittens are also exposed to our Rottweiler, German Sheperd, French Bulldog, and Cavalier King Charles Spaniel as they come in and out of the house. Sphynx at my house do not know a stranger, they love everyone young and old; they all want to be your friend. The integrity of the breed, the health and overall well being of our cats is of upmost importance. Our cats are TICA and or CFA registered and are scanned for HCM every 12 to 18 months.